Large crowds descended on the world’s largest travel trade fair, ITB, which was held recently in Berlin. Around 180,000 travel lovers jostled around the exhibitors’ stands, gathering information on African safari adventures and tours of the Alps. However, it remains to be seen whether or not these travel plans will actually be put into action. The travel market has felt the effects of the economic and financial crisis, and the number of trips taken fell by 1.5% in the 2009 tourism year. But consumers are not simply doing without their vacations – many are instead opting for a change in direction. 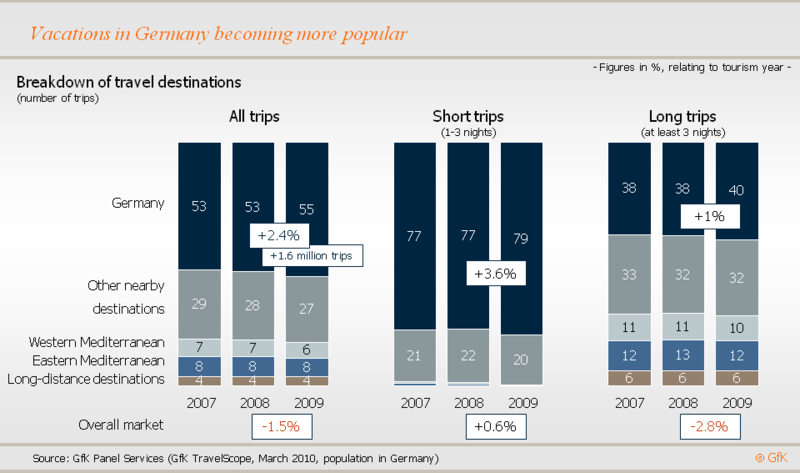 In line with the “homing” trend observed during the crisis, characterized by greater enjoyment of being in one’s own home, Germans also focused on nearby destinations for their vacations in 2009. Contrary to the general trend, Germany as a travel destination has seen growth of as much as 2.4%, and the growth rate for short trips is even higher, at almost 4%. The market share of vacation destinations located between the North Sea coast and the Alpine foothills has risen from around 53% to approximately 55%. These are the latest findings of the GfK TravelScope survey. Overall, tourist businesses in Germany can be satisfied with their balance sheet, having sold 1.6 million more domestic trips in 2009. However, despite the generally sunny skies over Germany, a few clouds cast a shadow: the enthusiasm for holidaying in Germany was not fully reflected in the revenues recorded by hospitality businesses. The reason for this? Growth was primarily attributable to short trips of just a few days, while long vacations, for which travel operators and tourist businesses correspondingly receive more money, only recorded growth of around 1%. Fresh sea fish or dumplings with sauerkraut? 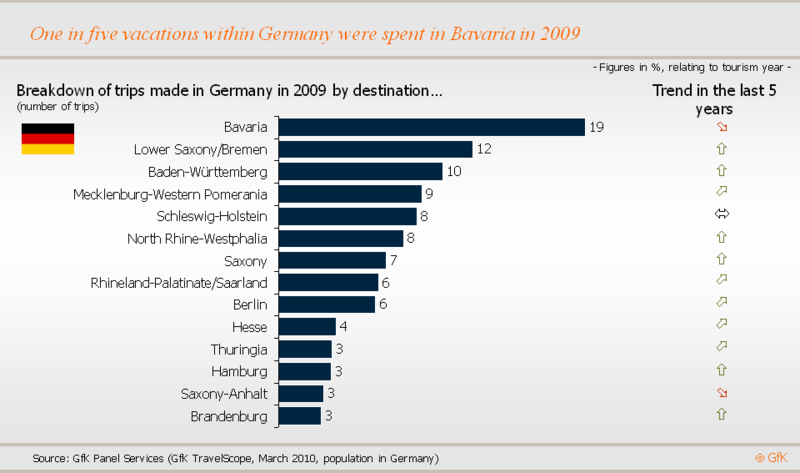 The latter is certainly a hit with holidaymakers: Bavaria is the number one vacation destination in Germany. Of the almost 69 million trips made within Germany in the 2009 tourism year, just under 19% were made to the Free State of Bavaria. However, holidaymakers also feel the North has something to offer: more than 11% spent their vacation in Lower Saxony, which takes the number two spot in the destination rankings, just ahead of Baden-Württemberg with almost 10%. Just behind, in fourth place, comes Mecklenburg-Western Pomerania, which was the destination for 9% of vacations and therefore the most popular state in Eastern Germany. Bringing up the rear is Brandenburg, with a share of 3%. The state is catching up, however, and recorded the highest rate of increase compared with the prior year. Consumers use shorter trips to relax and get away from the everyday realities of the financial crisis. Switching off, immersing oneself in relaxing surroundings, forgetting day-to-day life: the trend towards spa visits continued unabated in 2009 despite the recession, especially in Germany. In particular, those aged between 35 and 49 discovered the pleasures of wellness vacations in Germany last year. The late summer months were especially successful, since many Germans obviously delayed their vacations before concluding that the crisis would hit the labor market less hard than initially feared, and then took a wellness break as a last-minute alternative. 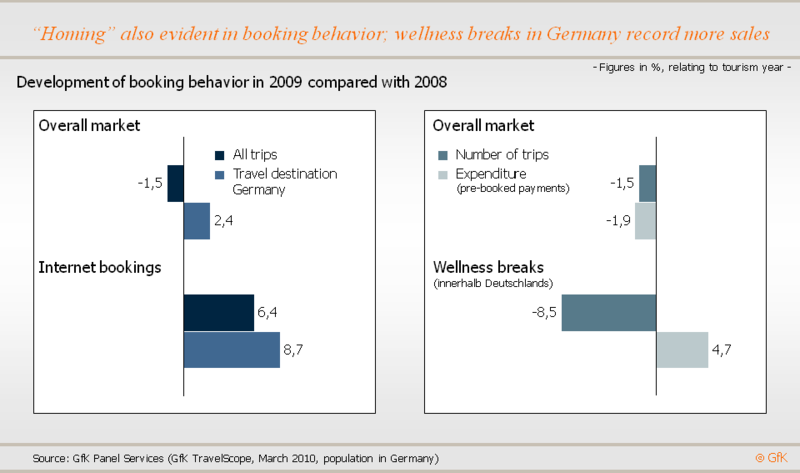 Total expenditure on pre-booked wellbeing trips in Germany rose by 4.7% in a year-on-year comparison, despite the fact that the number of wellness vacations dropped back by around 9% in 2009. Fewer trips, higher expenditure – the up-market wellness industry was evidently one of the prime beneficiaries of this trend. In fact, sales in the 4 and 5-star hotel industry grew by double digits last year. Consumers are even staying at home more often than before to plan and book their vacations. They are making greater use of the world wide web to find their dream destination and book trips. The trend towards Internet bookings has increased continuously over the past five years, and in 2009 alone, around 6% more trips were booked online than in the prior year. Among those traveling within Germany, growth was almost 9%. Fewer and fewer consumers went to a travel agency, with the share of bookings in this area around 9% lower in 2009. Outlook: how will we travel in 2010?